26 March, 2004: Aunt we running out of time? Not much to say here, but before I go on holiday for the weekend I just thought I'd remind my half-dozen readers that the deadline for responses to the public consultation on the Review of the BBC Charter is this Wednesday, the 31st March. So, if you have an opinion about the BBC -- and, frankly, who doesn't? -- or think that government consultations are a good idea, and should be encouraged, then follow the links and submit a response. If you can't be bothered to write out a whole spiel, then there's a questionnaire version of the consultation that you can fill out. It is a commonplace among racists of the `I'm not a racist, but...' variety to say things like, ``The police correctly say more black people commit crime so more are stopped.'' This is a misconception which needs to be squashed. Suppose that there are w white people and b black people in some population. Suppose further that every so often a crime is committed, and that the victim is able accurately to report the ethnicity of the perpetrator (assume that these are muggings, or `hot' burglaries, or whatever). W crimes are recorded in which the perpetrator is white, and B in which the perpetrator is black. Imagine that B > W; that is, more crimes are committed by black criminals than by white criminals. (In some areas of the country this is the case, we are told; these, presumably, are mostly areas with more black people than white people.) What does this tell us about the likelihood that an arbitrary black person -- such as might randomly be stopped by a police officer -- is a criminal, relative to the likelihood that an arbitrary white person is? The reason (which should be obvious) is that different criminals commit different numbers of crimes; the difference, that is, between `more black people commit crime' and `black people commit more crime'. These two statements are not the same. As an extreme case, suppose that every white person commits one mugging a year, and one black person commits some large number N > w of muggings, while the rest are law-abiding. In this case, the probability of a randomly-selected white person being a criminal is 1, but the probability of a randomly-selected black person being a criminal is 1/b, a much smaller number. That is to say, in this case it is b times more likely that a random white person stopped by a police officer is a criminal than a black person is even if there are more crimes committed by black people than by white people. Without additional information about the numbers of crimes committed by individual criminals of each ethnicity, aggregate data about numbers of crimes won't tell us anything about the `propensity to crime' of white and black people. In reality, the situation is not as extreme as in the example. Now we encounter a separate problem. Suppose that both black and white people commit crimes at the same rate, with the probabilities that an individual black or white person is a criminal being equal. In that case, the number of crimes committed by people of each ethnicity will be in proportion to the ratio of ethnicities in the general population. Imagine that the police attempt to control crime by stopping and searching people at random (perhaps they look for stolen goods or something). Suppose further that the police are racist and stop ten times as many black people as white people. In this case, even if black and white people are equally likely to be criminals, the police will still find ten times as many black criminals as white, because everyone they stop has an equal chance of being a criminal, and they are stopping ten times as many black as white people. And, worse, their tactic is self-reinforcing, since an ill-informed police officer (or politician) might infer from the statistics that -- because so many black people are being arrested -- even more black people should be stopped and searched. But of course this is an incredibly inefficient (as well as unfair) way for the police to try to cut down on crime, since they are letting the (usually much larger) white segment of the population get away with much shallower scrutiny. And it might lead a lazy observer to conclude that black people are more likely to commit crime, while in fact what they're seeing is the effect of racist policing. Now, all of this is just a model. The police don't investigate crime solely by stopping people at random, and there are lots of other relevant factors in criminality, some of which are correlated with race (for instance, poorer people are more likely to be criminals -- at least of the Bill the Burglar variety, if not the Martha Stewart kind -- and, sad to say, history has left black people on average poorer than white). As with so many things, the real situation is very complicated. But that's all the more reason not to make generalisations like the one which started me off on this rant. Writing is abundantly difficult without artificial constraints. Adding arbitrary limits to what you may scrawl -- such as to abandon that most common, fifth, symbol of our traditional Latin orthography, or lay down only so many words within pairs of stops -- without doing so ghastly an injury to grammar or signification as to crowd out all worth is in my opinion too hard to do. You may not concur; if not, visit this for compositions surpassing this slight try. You can add your own, too. 18 March, 2004: Oh what a lovely `war'! A thought (which occurred to me only recently, but presumably isn't original -- not that that matters): why are political commentators, especially on the right, so keen to describe efforts to prevent terrorist attacks as a `war on terror'? Ignore for the moment the fact that you can't make war on an abstract noun (or an emotion); obviously the term is intended to be parsed as `war against terrorists'. But `war' is a funny term to use here, because a war has two sides. If we're in a war with the terrorists, then actions we take against them are `acts of war' -- but so are the actions that they take against us. That's the difference between fighting a war and prosecuting crime. Describing anti-terrorism measures as `war' legitimises the terrorist acts we are trying to prevent. So why are right-wingers -- always keen to tell us that they are more opposed to terrorism than others -- so keen to regard our current circumstances as a `war'? And as a what-if question, suppose that during the late Iraq unpleasantness, Iraqi forces had tried to kill George W. Bush. Do we think that the United States would have described this as a legitimate act of war, like their attempts to kill Saddam Hussein? The basic gag with TCPA (and the Microsoft technology, which is called NGSCB, for `Next Generation Secure Computing Base', and which will presumably win out in the marketplace, partly because Microsoft is a big evil monopoly and partly because the IT industry is likely unable to resist the allure of a five-letter acronym) is that each new computer is equipped with a little sealed cryptographic gadget. A program running on the computer can ask this gadget (which in TCPA is called the `Trusted Platform Module', which is particularly confusing, since the acronym `TPM' already means something completely different in this field) to produce a signed statement about the `identity' -- meaning a secure checksum, a large number which uniquely identifies a particular thing -- of the program. This process is called `remote attestation', and it is designed to allow people to build services which can only be used with the software intended by their designers. Most web services aren't like that, of course -- you can use any web browser you want, and they rely on standard protocols that anyone can implement. But if you want to restrict the use people make of your service, that's bad news; and this kind of restriction is what remote attestation is supposed to let you implement. As an example, an online music shop might use remote attestation to make sure that you only download and play music from its servers using their own music player, which could make sure you listen to adverts in between songs, prevent you from playing the songs you've bought for more than a month after you've purchased them unless you pay further protection money, and stop you from recording them onto a CD. (It could also stop you from doing Bad and Wrong things like transferring them onto your iPod or -- horror of horrors -- giving copies to your friends. If you think the other examples are ridiculous, well, witness the DVDs which force you to watch the copyright warning and trailers in sequence, without fast-forwarding, before they allow you to watch the film.) For a slightly less offensive example, your bank might require you to use its own special client to access your bank account -- rather than your normal web browser -- as a condition of using their service; ostensibly this might make the service more secure against fraud, but it's hard to see why your bank should be making choices about what software you run on your own PC. This means that `remote attestation' is pretty useless for Free software, I remain convinced that it will be close-to-useless for the other kind, too. Imagine that music playing program again. As I said, it's designed to prove to the music shop that it's a kosher version of the player before it will play any music. So to start with the record company has to have a database of the checksums of all the versions of the player program it's released. But now observe that the nasty vicious user might have installed some other software which is designed to capture the output of the program and save it in a file. Clearly we can't put up with that, so the software will have to ask the TPM to verify that the sound driver is kosher too. So now the record company needs a list of the checksums of every sound card driver in the world. Except that's quite a lot of work, so they'll probably only pick the five most popular ones, leaving users of less-common hardware high and dry. But now they realise that the user could modify the operating system itself to intercept data coming out of the music player. So now the record company needs a list of the checksums of every version of the Microsoft Windows kernel which they regard as kosher. But a device driver -- unrelated to the sound card -- can modify the kernel after it's running, so now they need a list of all the other device drivers they regard as OK. The same goes for more fundamental parts of your PC, such as the BIOS itself (which TCPA is also designed to check up on). By this stage the record company finds itself in the position of vetting every Windows program in the world to check that it's happy with releasing its music to be played on a system with that program running, which is obviously going to be pretty expensive and hard to keep up with; or defining a short, restrictive list of software it regards as safe, which will probably be OK if you only run common programs on your PC, but infuriating otherwise; or giving up on the whole idea as basically a waste of time. Even the middle option has a serious technical problem, which is that the record company still has to keep up with new versions of any part of the system which might be upgraded, for instance if a security hole is discovered in them. And if they're lax about doing that, users who upgrade as soon as bugs are fixed will find that none of their music will play any more, which is hardly conducive to good security. There are ways to ameliorate some of these problems -- one of them is, rather than relying on checksums of programs, to accept any program which is cryptographically signed by a `trusted' (there's that word again) manufacturer -- but at some point you have to face up to the problem that someone will have to maintain this big database of stuff. And as soon as a single program which can be used to subvert the `security' of the system creeps into the database -- that is, the program becomes `trusted' -- the whole thing is blown apart in an embarrassing expensive mess. That is to say, any security which is based on `remote attestation' and a catalogue of permitted software will be extremely brittle. But... this is all that `remote attestation' can be used to do, so far as I can see. That makes it kind-of useless. So why is so much effort being expended on it? Why is Microsoft developing a virtual machine -- the `Common Language Runtime' -- and, indeed, the rest of the `.NET' effort about which we have heard so much lately? After all, they don't really care about portability to non-Windows platforms, since their entire strategy is based on forcing users to buy Windows if they want to make use of Microsoft software (they even claim -- ludicrously -- in their `licence agreement' that you can't run their software on another operating system); and they don't really need hardware independence, since Windows only runs on one kind of hardware anyway. One of the things that a VM (virtual machine) lets you do is to impose a security model on programs which run inside it. For instance, the strangely popular Java VM has a security model that is supposed to prevent `applets' which run inside a web browser from doing things which they shouldn't (like deleting all your files or sending your bank details to Nigeria). It turns out that the Java VM's security model had all sorts of problems, but with enough work this kind of thing could be fleshed out and made to work properly. Once you have a VM and a security model inside it, remote attestation suddenly becomes a workable tool. If the virtual machine really can impose effective restrictions on the software which runs inside it -- for instance, allowing a music player to write only to an encrypted data store, and never reveal the key; an online banking program to be protected from all the other programs on the system; or a file viewer or web browser to write only to a temporary filesystem for downloaded files -- then it's enough for a remote service to be able to prove that the virtual machine is a particular, trusted, version using `remote attestation'. Once that's done, the service provider can rely on the VM itself to do its dirty work. No huge catalogue of kosher software is required, but rather a much smaller catalogue of approved versions of the virtual machine. Even better, there's only one manufacturer of the virtual machine -- Microsoft -- and, just to be helpful, they can control the database too. Isn't that convenient? Expect more bad news on this front in the future. 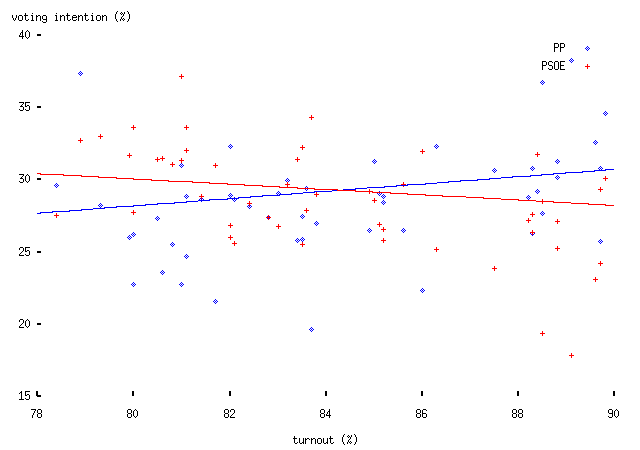 The correlation between turnout and voting intention is pretty lousy; the regression also suffers from serious colinearity problems and should probably not be taken too seriously. 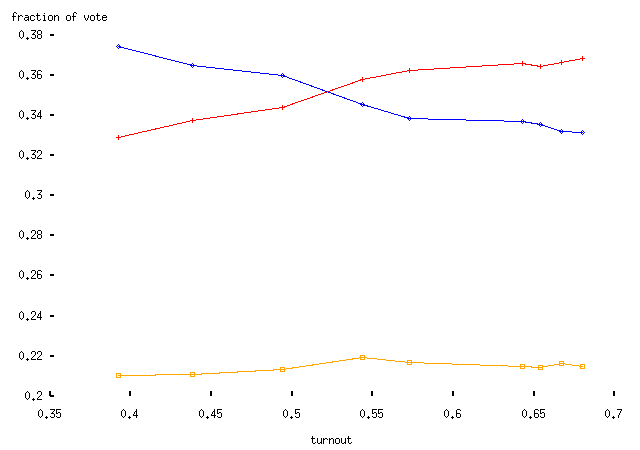 That said, if we (unwisely) wanted to conclude anything from the above plot, it is that the supposed effect -- that increasing turnout increases vote share for the PSOE -- does not occur. This is a surprise. As I say, without polling data which are broken down by likelihood to vote, or a less noisy timeseries, we can't really confirm this. But the increased-turnout-leads-to-PSOE-victory theory isn't supported by the evidence so far. Update: Matthew Turner links to this UPI story, which states that an opinion poll on Wednesday 10th March, the day before the bombing, showed the PSOE in the lead by `less than a 2 percent margin' -- but in the lead nevertheless. So the `surprise result' may not have been a surprise, or even caused by terrorism. Historically, many terrorist groups seem to have struggled with the technical challenges of bomb-making, or, more specifically, bomb triggering. 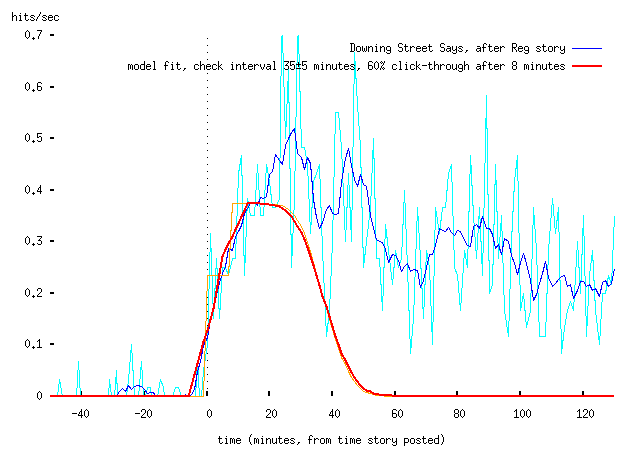 Some readers will remember a 1996 IRA bus bombing, supposedly an accident which occurred when the perpetrator -- whose time-bomb was controlled by components scavenged from a video recorder -- misunderstood the 24-hour clock and blew himself up on the way to a target he intended to destroy the next morning, after he had made his escape. The `shoe bomber' Richard Reid showed even less technical prowess, being apprehended by his intended victims while he struggled to light a match and ignite the fuse of his diabolical footwear. One IRA `bomb factory' was -- apparently -- destroyed after the security services installed an induction loop in the ceiling; the bomb-makers, too ill-informed to twist the wires connected to their detonators, died for their mistake. Natural selection is, of course, a phenomenon of greater importance in bomb-making than other professions, and it seems that the IRA at least learned from these mistakes, though that didn't stop them from claiming that their Remembrance Day bomb at Enniskillen was triggered accidentally by a British Army radio jammer. And there aren't any easy technical measures which can usefully be taken against this new application for GSM. With a couple of exceptions where phones aren't allowed or don't work -- notably on aeroplanes or in underground railways -- everywhere that people gather, presenting an attractive target for the political murderer, they also expect to be able to make and receive phone calls. From the perspective of the GSM network, a phone connected to a bomb is no different from a phone in someone's pocket. While evidence from phones used in this way may help investigators a little in their detective work -- for instance, they can use network records to search for a phone which was in the location where a bomb exploded, received a call at the time of the explosion, and then went off-air, and then search for the caller -- that's not likely to help enormously, especially since the terrorist could trigger the bomb from anywhere in the world and take steps to conceal their identity when they did. This use of mobile phones is likely to distress people a little, I suppose; the Mirror lead with the story Massacred by Mobiles, (at least it wasn't a story about GSM masts causing cancer) but this is the sort of thing we will, sadly, have to get used to as reliable wireless networking becomes pervasive. Nobody is going to claim that this threat outweighs the benefits of phones, but we'd better adjust to the fact that some of their uses are undesirable -- and inevitable. Probably the same will be true of other innovations, too. 13 March, 2004: You can't fight in here! For those who haven't seen it before, the clock is intended as a visual metaphor for the peace of the world. 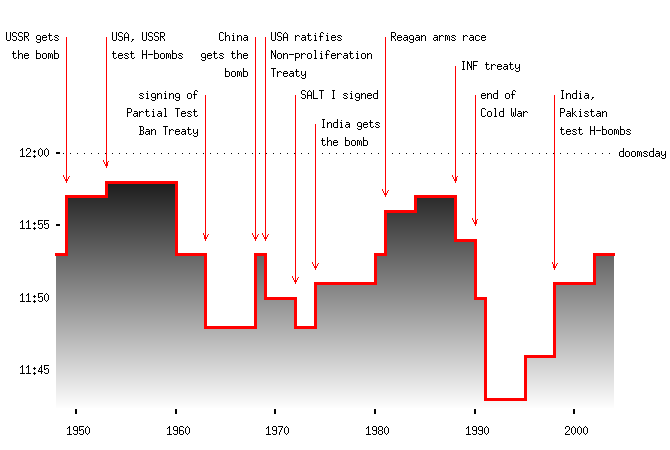 I'm not sure how much this tells us, but in its way it's a nice summary of trends in the Cold War. How much of a mess would this make? As I said above, I'm not sure whether a nuclear power station containment dome could be seriously damaged by an airliner crash. In 1988, Sandia National Laboratories in the US performed a test to address this question, by taking the fuselage of an old F4 fighter aeroplane and driving it into a concrete slab at 480 mph using a bunch of rockets. After the September 11th 2001 terrorist attacks, they published footage from the test on their website. The results of this test suggested that such a slab would be penetrated to a depth of about 2cm by the aeroplane fuselage, or about 6cm by the engines (which have very heavy axles, by comparison to the rest of the aeroplane). There are more details in this FAQ response; basically, the body of the aeroplane does very little damage (2cm penetration) but the engines go a bit further (6cm). Commercial aeroplanes are much heavier and have larger engines, of course. In my view the risk can't be ruled out, and effective countermeasures -- siting anti-aircraft missiles at nuclear sites -- are sufficiently cheap to be worthwhile in any case. 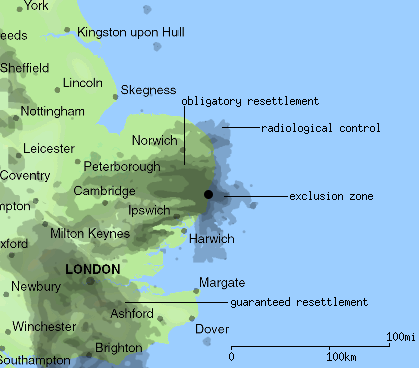 (This is probably of interest to Cambridge people only.) I've written a little program that generates an RSS feed of the films showing at the Arts Picture House, Cambridge's only halfway decent public cinema. If you use an RSS reader, you might find this useful. I've ranted about the deficiencies of RSS as a format before, so I won't repeat my complaints now. But I'm not really sure what the most useful way to present this information in RSS is. At the moment the feed shows information about any films which are showing in the next 24 hours and for which tickets are available, which means that the RSS feed is the answer to the question `what can I go and see at the cinema this evening?' or something like it. Each film is represented by a single `item' which is marked up with a date corresponding to when the film is first shown (that is, all the items are in the future -- if this breaks common RSS readers, I'd love to know, since I wrote my own and am too lazy to test anyone else's), so that the films appear in the right order. Anyway, I hope that this finds some use. Comments (especially simple suggestions for how to make the thing more useful) welcome (and thanks to Francis for already finding a bug in my comments program). You can also download the current version of the scraping program, artspicturehouserss, if you want to modify or improve it yourself. Update: users of the Blog lines aggregator can follow this link to subscribe to the feed. 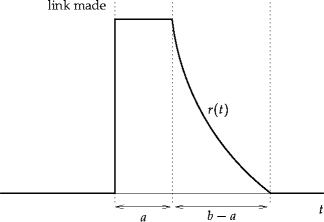 (that particular example is for a flat distribution of check intervals in a < D < b). 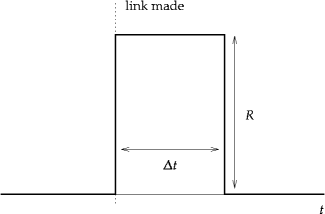 The thing to note about this function is that it leaps from zero to its maximum at the time the link is posted, and declines after that. 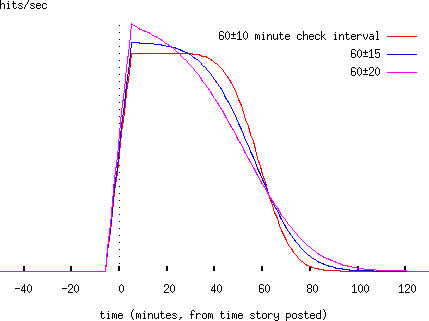 On the face of it, this is a bit surprising, though given the model you can think of it like this: in the first minute after the link is posted, all the people who check the first site every minute follow it, as do half of the people who check it every two minutes, one third of the people who check it every three minutes, and so forth. 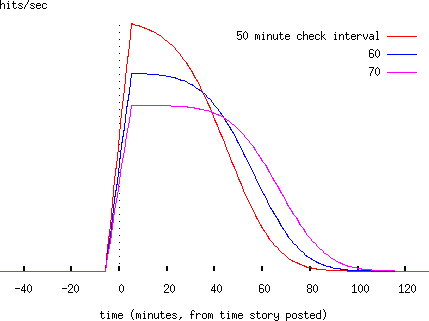 In the second minute, half the people who check every two minutes follow it, as do one third of the people who check every three minutes, one quarter of those who check it every four minutes, and so forth. 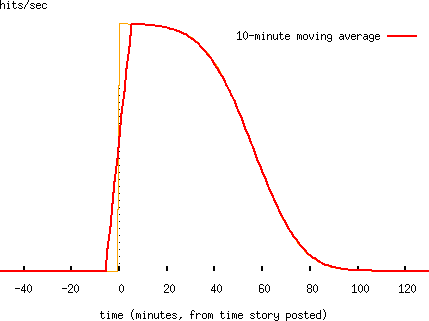 Of course, there aren't that many people who check even the most popular websites every minute; in fact the spike will be dominated by the center of the distribution. 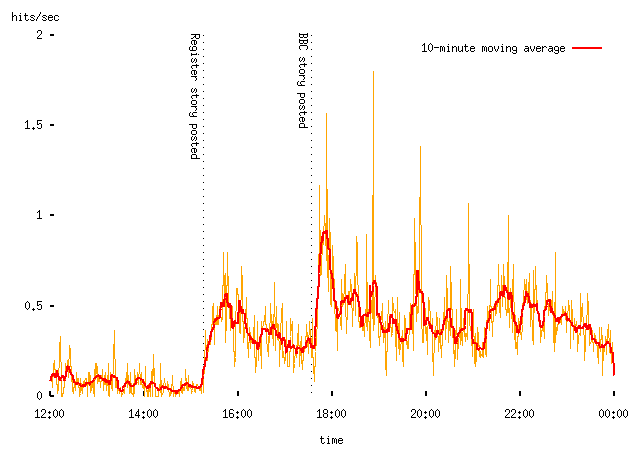 Note that in the traffic plots, I take a ten-minute moving average of the data, since traffic data are very noisy, and it's quite hard to pick out any meaningful trends without doing so. 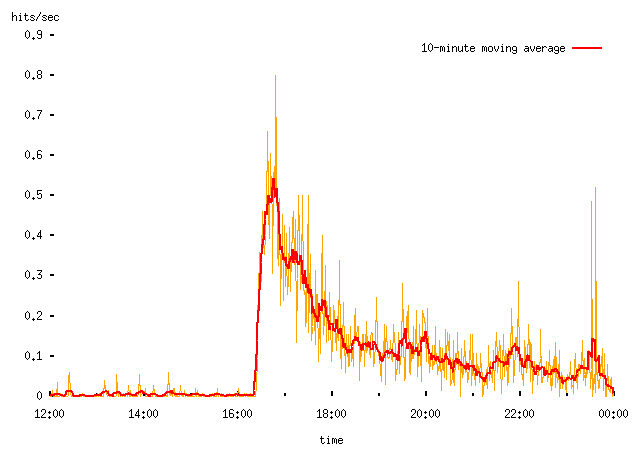 So the instant ramp-up of the spike is spread out over about ±5 minutes either side of the time the story is posted. 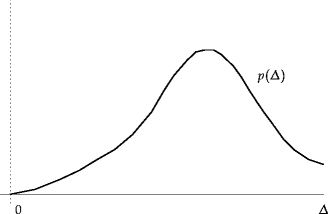 Note that if we try to fit one of these spikes, there will be a trade-off (covariance) between the mean and variance of the underlying distribution, and therefore ambiguity in the results we obtain. 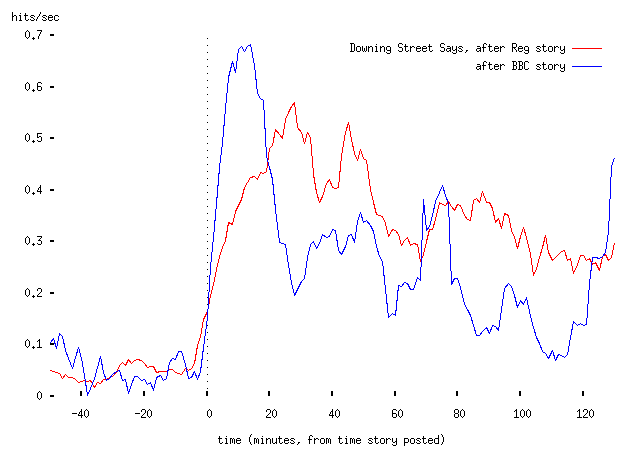 The posting of a link from the BBC site to Downing Street Says certainly resulted in a sharply-rising spike of traffic which fell off after a little while (note that the model only handles the first page view; obviously we expect to get a chain of hits from users who explore more than the front page of the site, but we don't model that). 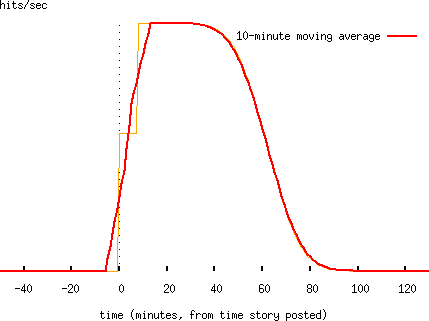 The Register's story resulted in a much less sharp rise, which the theory does not explain. More on that in a moment. -- the reason that this is surprising is that (at a guess) most NTK readers get the thing as an emailed newsletter, rather than by periodically checking the NTK website (this may be wrong, of course). But the explanation here is presumably that most users receive email by polling (using a protocol like POP3) rather than having it delivered directly to their machine (using SMTP or modern IMAP implementations). Under this assumption, the model looks exactly the same; what we're measuring here is the regularity with which NTK readers' email clients poll for mail. 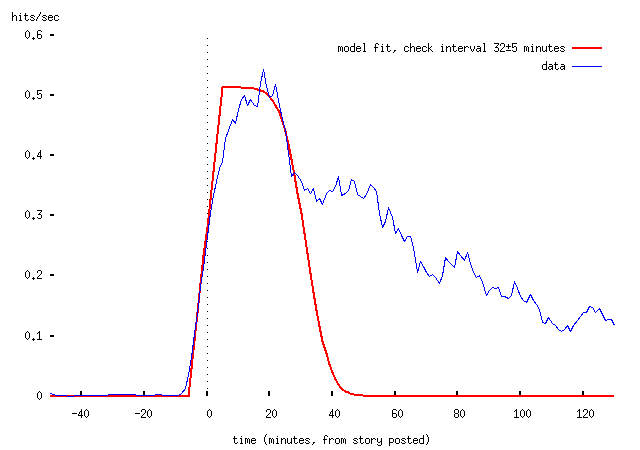 Again, the 32±5 minutes figure isn't to be taken very seriously (and I'm surprised that it's so long). 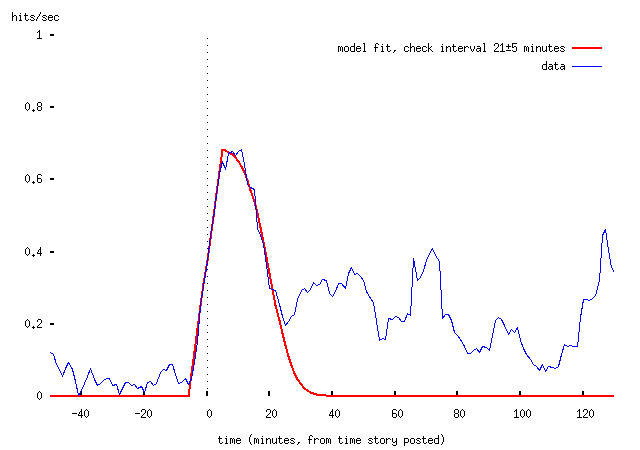 but this model now has so many free parameters that it can't be taken very seriously. 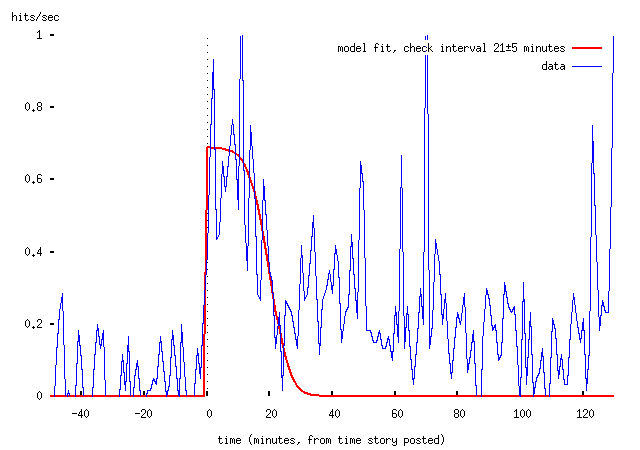 It also does't explain anything after the onset of the spike adequately, but one could imagine extending it for a series of spikes. By that point the model would have so many free parameters as to be completely worthless. Glory may be fleeting, but obscurity is forever.